Dubai, UAE, May 17, 2018: Independent Swiss watch brand Chronoswiss, in partnership with Tech Bureau Europe, announces the release of the second of their series of five luxurious crypto‐design watches - Ethereum - the contract. The specially designed limited edition series is in commemoration of cryptocurrency - the advent of a whole new way of transacting business. These extravagant models are being issued in a limited edition of just 101 pieces each, and they are available exclusively via the cryptocurrency exchange platform Zaif. In tandem with the Japanese company Tech Bureau, Chronoswiss has created an exclusive series of crypto‐design watches based on the Flying Regulator Open Gear. These limited‐edition collector's pieces boast a high‐end aesthetic. Chronoswiss is a renowned, long-established Swiss watch manufacturer steeped in tradition and famed for its high‐quality standards, its authenticity and its strongly held values. 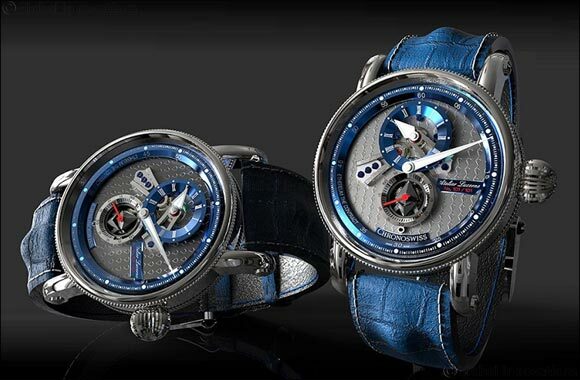 These luxury timepieces have been manufactured according to highest Swiss watchmaking standards. Already seen as unrivalled in terms of aesthetics and quality, they are therefore a must for every crypto enthusiast. The limited‐edition watches can be purchased by anyone registered on Zaif. The corresponding auctions will take place within specified time frames between April 13 to 27, with the watches listed in the same way as tokens. Customers must place their bids as buy orders. The 101 highest bids per model will give the respective bidders legal ownership of one crypto‐design watch. It is just as easy as buying cryptocurrency. Dial Elaborate construction on two levels: bottom level galvanic black with multi-logo print of Ethereum, upper level featuring screwed-on skeletonized train wheel bridges and funnel-like constructions for hours and seconds display. Skeletonized small seconds with Ethereum logo.